At Inhabitat, we’ve been showing our support for COP15 by telling our readers about the need to take action on climate change. 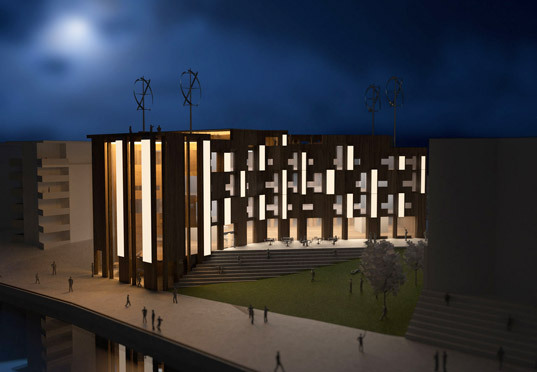 Various Architects in Oslo, Norway has taken a different path and did what they do best – designing a concept for an ultra energy-efficient building that could help mitigate the world’s climate problems! The building features a variety of energy-saving measures including operable insulated shutters on the building’s facade, wind turbines, a green roof, and the use of local and sustainable building materials – sounds like a pretty fitting tribute to COP15 if you ask us. With a jigsaw puzzle-like facade, the building’s exterior is made up of operable shutters that can transform the building’s facade from 60% to 20% window area. The shutters can be opened up during the day for passive heating — but can also be closed to keep heat in. Due to the longitude of the Nordic countries, the architects also thoughtfully designed in LED lights in the interior of the shutters to provide lighting for the winter months when days become much shorter. The shutters, as well as the building’s structure, are made of woods with a low carbon footprint. 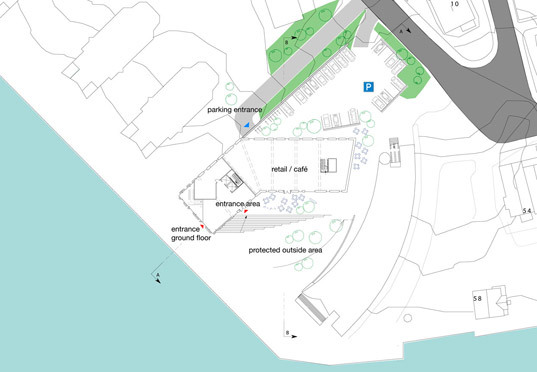 The building’s location next to the sea also provides the building with numerous benefits. The sea water can be used to heat and cool with the help of water-controlled heat pumps. The architects also note that air heat recovery, demand-led controls and efficient insulation would make the building’s energy use much lower. Up on the roof, 4 wind turbines would harness the wind of the sea for energy. Also on the roof, the normal hard-scape has been turned into a landscape that collects and filters rainwater and stores the water away in tanks for later use. Various Architects and Ramboll believe that the ØKOffice project demonstrates that architects, engineers, and developers of new office buildings should push harder to develop highly energy efficient buildings with a zero net-carbon construction. We should not accept the minimum reductions required by law as standards, but should see them as a challenge to do better. Good luck to the COP15 representatives. The relevant numbers were included in our press release, but didn't make it into the article on inhabitat. Visit our webpage for more information: www.variousarchitects.no The building's energy use has been calculated to 72 kWh/m2/yr - a class A Energy rating which is also below the 75 kWh/m2/yr used in the Passivhaus standard. Passivhaus has not been ratified in norway yet (hopefully soon!) but we have used the main principles of the concept. 10% of the energy is provided by the 4 Quiet Revolution turbines, the rest would come from hydro-electric sources in the norwegian power grid. Ramboll UK in Bristol have been great collaborators on the project, and we have quite a bit of technical information to back up the pretty renderings. So it's claimed as the most efficient in Norway, yet has no projected energy use numbers (say, kbtu per sq/meter). What gives? At Inhabitat, we've been showing our support for COP15 by telling our readers about the need to take action on climate change. Various Architects in Oslo, Norway has taken a different path and did what they do best - designing a concept for an ultra energy-efficient building that could help mitigate the world's climate problems! The building features a variety of energy-saving measures including operable insulated shutters on the building's facade, wind turbines, a green roof, and the use of local and sustainable building materials - sounds like a pretty fitting tribute to COP15 if you ask us.